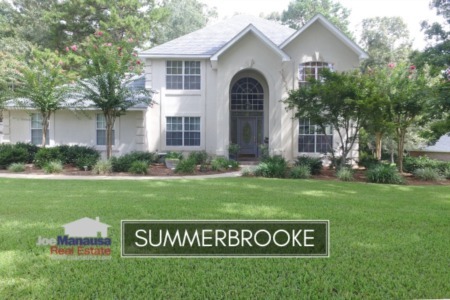 Summerbrooke is one of the top selling neighborhoods in NE Tallahassee, featuring executive homes like you would expect to find in an affordable golf course community. As with all neighborhoods in the popular 32312 zip code, location (location, location) is the driving force that keeps buyers interested in the homes for sale in Summerbrooke. Unlike the report we did on high end home sales yesterday, home prices are at the top of the sweet spot for Tallahassee real estate and should do very well in the years to come. In this report, we will look at home prices, home values, and sizes of homes in Summerbrooke, as well as show current listings in the Tallahassee MLS and all closed home sales going back to 1991. For the three real estate graphs found below, you will find the number of closed home sales for each year (red columns, measured on the left vertical axis), and an important real estate statistic shown in blue (measured on the right vertical axis). It's important to note that the written analysis contained here was done on the last day of April 2015, but the charts and table will continuous update into the future (so you can bookmark this page if you want to keep tabs on the housing market in Summerbrooke). Home prices appear to be strengthing in 2015 after having declined 3% in 2014. The average recorded home price for Summerbrooke in 2015 thus far has been $347,000. Home sales declined heavily in the fourth quarter of 2014 and remain sluggish through 1/3rd of 2015. 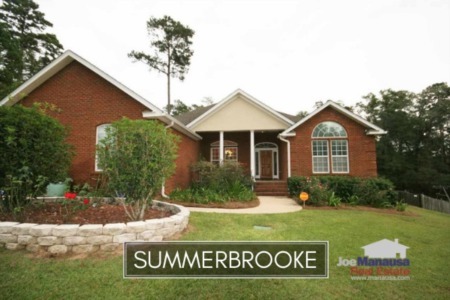 Through April of 2015, there were just 3 closed home sales in Summerbrooke. If this pace continues to the end of the year, it would result in the fewest home sales in Summerbrooke since 1991. Average home values in Summerbrooke declined slightly in 2014, but have recovered nicely thus far in 2015 (though this might be related to the fact that smaller homes have sold). Even so, average home values are currently just 8% higher than the 11 year low established in 2012. If you've been thinking about buying a home in a golf course community, this might be your best chance ever to find a great value in Summerbrooke. Through April of 2015, the average value of a home sold in Summerbrooke has been $131 per square foot. The 3 home sales in 2015 have averaged 2,645 square feet, meaning buyers are choosing homes at the very lowest end of this range. With just 3 sales under its belt thus far, I think it would be a bit early to call this a trend. I hope you enjoyed our April 2015 update on home sales in Summerbrooke, please feel free to drop me a note if you have questions not covered in this report.